1 1/2 cups warm water up to 130° F.
Combine flours, walnuts, raisins, sugar, salt & yeast in a large bowl. Stir in water until it’s well combined. After 3 hours dough will become puffy and dotted with bubbles. Transfer to a well-floured surface and sprinkle dough with a little flour. Using a scraper fold dough over 10-12 times & shape into a rough ball. Place in a parchment paper-lined bowl (not wax paper) and cover with a towel. Let stand on counter top for about 35 minutes. Meantime, place a 3 to 5-qt Dutch oven with lid in a cold oven and preheat to 450° F. My oven takes 35 minutes to reach 450°. When oven reaches 450°, carefully, using oven gloves, lift the parchment paper and dough from the bowl and place gently into the hot pot. (parchment paper goes in the pot too) Cover and return to oven and immediately REDUCE HEAT TO 400° F. Bake for 30 minutes. After 30 minutes, remove lid and parchment paper. Return, uncovered, to oven and bake about 10 more minutes. 61 Comments on "No Knead Fruit & Nut Bread"
Has anyone tried this recipe but adding cinnamon? I have made several of your breads each wonderful. I made the 2 hour White bread tonight. I made this one last week. I was wondering would this work substituting rasins with craisins? I love craisins in bread but the recipe I use is 18 hours rise time by then it makes a purple loaf. My first time making bread & SUCCESS! I tried the regular bread first and it turned out perfect. Last night I decided to try the fruit & nut. The shaping didn’t go very well & I thought for sure it would not turn out. The dough was really sticky, runny & wet. I folded in some extra flour, but could not get it to dry up & shape. I decided to bake it anyway and we are in heaven enjoying this delicious bread for breakfast this morning! IT WORKED! I don’t have whole wheat flour. Can I use bread flour for this recipe? Whole wheat bread, best one ever and I have baking bread for 50 plus yrs. Thank you Jenny! Thank you for your review! What do you think about letting the dough rise over night? Would it be too long? If I can’t bake for 7 or 8 hours after mixing, do you think it would be better to mix it up and pop it into the fridge? Thank you in advance for your advice!! Please read the notes at the top of the recipe. Thank you Jenny! Nothing like reading the directions… I have a loaf in the oven right now! This was easy and delicious! I used only all purpose flour, didn’t have whole wheat. I had a small bag of dried fruit and nuts that I just tossed 1 cup of it into the mix after rough chopping the larger nuts. This bread is so delicious. I make a few changes, such as, I use brown sugar, half raisins and half dried cranberries. I make only a half recipe, starting it at night with cool water. Then in the morning I bake it. This smaller loaf is just a perfect size for my husband and myself. It is so yummy—-my “go to” recipe! I have halved my loaves before and found it still took the same amount of time to bake. Hi Jenny! This is my 3rd one in 2 days. Two fruit and nut (second one with cranberries instead of raisins, as I ran out). The first bread was your faster no knead one. I can’t wait to try this one!! Love your videos…..you’re so happy! I baked this bread but in rolls form this morning and oh, it was incredibly delicious again! I fed my family and boss and they loved the bread! We all had t for lunch- sooo satisfying! I got the roll idea from Jenny’s crusty roll recipe- Thank you Jenny! You’re wonderful! Hyvää tuli pataleivästä ,hedelmiä ja pähkinöitä joukkoon! How long should we wait before cutting the bread once it’s out of the oven? I just made it..followed the recipe exactly but couldn’t wait to try it and cut into it the bread right away…it doesn’t seem quite cooked. Any thoughts? Bread continues to cook inside after it’s removed from the oven so next time, let it cool before cutting… at least 20 minutes but even longer is better. Dear Jenny, I am new to this no knead bread and today I tried this recipe. I preheat my oven for over an hour yet it would not reached 450 F, it was only 420 F. I have this oven for more than 10 years and have never heated it higher than 350F. Everything stage of preparation went well until this. So I still put the bread in but unfortunately it stuck to the parchment paper and wasn’t cooked through and didn’t rise like yours. I then tried using the fan in the oven and lo and behold, it could reach 450F easily! I wonder if anyone needed to use the fan mode in order to reach the required temperature like mine? My oven is an Italian brand, Ariston. Any helpful tips would be much appreciated , thanks! Fantastic-Superb-Delicious-Easy to make-healthy sweet treat, we love it. I did use cranberries instead of raisins and it is wonderful. Thank you again. Can you please please please give us a rye bread recipe. Easter is coming and it would be great to have homemade rye bread in the Easter baskets we take to church for the blessing on Easter Saturday,which is a long time tradition in our family. Hope you have a very happy Easter. Amazing bread… So good we have for dessert, I add 2 tsp cinnamon. And use raw sugar. Took to work next day and someone said they’d pay me to make them another loaf. Thank you Jenny! Have been making the no knead rolls and they come out delicious. This one, though, needs only 35 minutes standing before going into the oven? Thank you for sharing, Jenny, love the way you talk. The smell that came from the oven was delicious – as is the bread!! The dough has such wonderful texture! I’m glad it turned out. 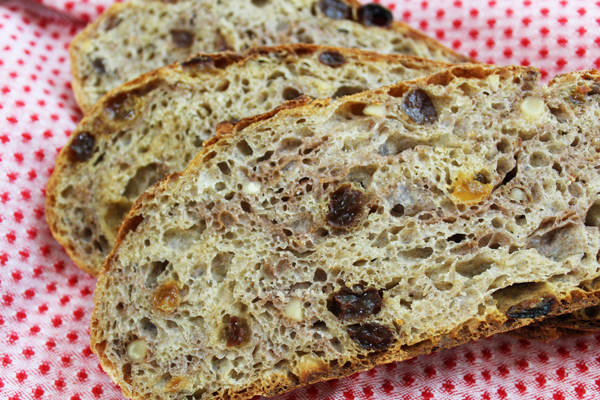 Made this bread yesterday, but added Ocean Spray dried cranberries, instead of raisins and pecans. I had so much fun and the bread is fabulous. Thank you so much for your recipes. We’ll be trying the white and wheat bread cast iron pot recipes soon. Instead of sugar, can I use maple syrup? I have a set of ceramic (stoneware) open bakers & covered bakers from Rachael Ray that are oven safe to 500 degrees. They work very well for this type of bread. I’ve used the shallow open Baker( no lid) & it worked great! The set I have is from Rachael Ray Cucina line. They are beautiful! Thanks for sharing this because not everyone has a Dutch oven. Love, love your recipes and your foolishness Jenny! Keep up the great work, we love ya! Thanks for the great recipes! Love this bread recipe…. I’ve been making two a week since I found your recipe… Just love it….. I do not have a dutch oven :-(. Any suggestion? I’m a newbie in baking and i have been enjoying your site and videos. Thanks for sharing! I have only used an enameled cast iron pot (dutch oven) so I can’t speak from experience. I know that the pot has to be oven-safe to 450 degrees F and the lid must have oven-proof handles. You could look around the internet to see what anyone else has used since this type of no-knead baking is getting really popular. Before buying a dutch oven, I used a glass casserole dish that had a lid and found it worked well. I still use the glass one when I bake multiple breads at once so it’s a pretty decent substitute. Hi everyone, I love no knead bread, this is a really good recipe, especially when you have weekend guests and want to impress! For those of you who don’t have Dutch ovens and want to try before you buy, I have successfully used Pyrex casserole dishes of various sizes with no problems at all. Just be careful when you take out of the oven. Do not put down on a cold marble worktop saver or similar. Put onto a folded tea towel, the temperature change is the only thing that could cause you trouble with the Pyrex. Thank you for sharing this because so many people ask about other options. I use a big stainless steel pot and the loaves turn out great every time. Me too, a stainless steel Dutch oven with stainless steel handles, works so well. Jenny, thank you for the great recipe. I took some “cook’s license” and used 1 1/2 tsp salt and 1/2 tsp yeast, 1/3 cup raisins and 1/3 cup chopped dried apricots as well as the toasted walnuts. Then I let it sit about 15 hours. I shaped it and let it rise for two more hours before baking. It is about an inch taller than your picture. Very delicious! Use to watch your great TV program. Loved your program . . . Love your cooking site. Eager to try your great recipes, they look and sound wonderful. Made this bread today. Was skeptical about the 1/4 tsp yeast. It did not rise much but high enough. Baked per directions. Crust was nice and crisp and the inside soft. Was about 3″ tall in a round loaf. Used pecans and golden raisins. Great taste. Hello Jenny, this recipe is great! I wonder if I can replace the warm water with warm milk to make the bread more ‘milky’? I have only used water so I don’t know. I can only suggest you search the internet to see if anyone has made a no knead bread with milk. I love your site!I I have many years of bakery experience making breads ,sweets of all sorts and always trying other ideas out there.Keepupthegoodwork,I am hooked on you! Mine is a about 10 1/4 inches across the top and 9 inches across the bottom. i’m so glad I opened your e-mail Jenny and saw this delicious bread I plan to make but don’t have a dutch oven so what can I use/Please answer soon. I have only made mine in a Dutch oven and do not know what else would work. It has to be something with oven-safe handles & lid and it has to be able to withstand this very high heat. I did not invent this method so you might be able to find some other information on alternate pots online. This has become my all-time, go-to sweet bread recipe. I included dark and golden raisins, dried cranberries, chopped dried apricots, and chopped walnuts. First time was perfection. Dense, delicious, heavenly texture, and chewy. No need to have other recipes – this one fills the bill. Thank you for the time it took to perform the trial and error, practice makes perfect. This bread is a No Knead Miracle Bread! me and my dad loved this recipe! as i would love to start a blog! I stumbled across your website yesterday and just love it!! You are too cute and I find myself laughing at some of your comments (like the one you made before starting the spaghetti and meatball recipe)! I want to try the flour tortillas tonight. I have never thought of using the oil instread of Crisco so that will be a challenge..and the spaghetti and meatballs…then the cabbage rolls!! Yum! Have a great holiday! Oh, yes, I want to make the Mexican Wedding cookies, too, and the granola bars/granola….the list goes on and on..
Can’t wait to make it for my wife and I. We are going to celebrate 45 years of marriage. I’m the luckiest guy in the world! We married when we were both 17 years old and we made it through the tough times and I love her more than anything in the world and we had two wonderful sons and 5 wonderful grandchildren. The Lord has Bless us very much! Congratulations on 45 years together! Thank you. Can’t wait to try this one out! Wonder if I can use almond flour for low carb version. FABULOUS! Easy and Super-Delicious! I LOVE bread also. Thank you! 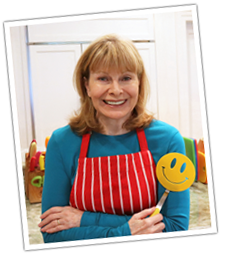 Adore your recipes, and admire you, Jenny!